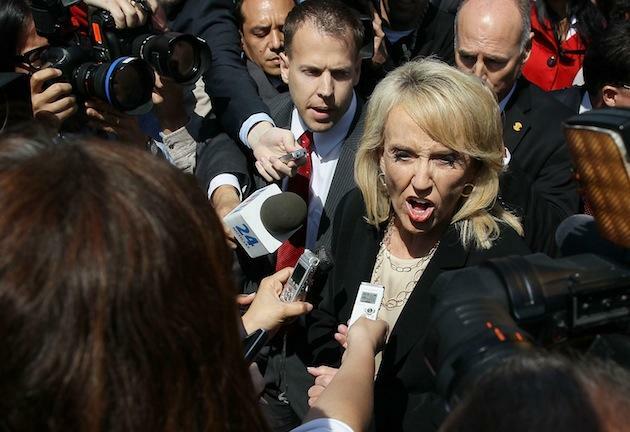 Jan Brewer denies deferred action recipients driver’s licenses; will other governors follow suit? A group of young illegal immigrants in Phoenix was preparing for a rally on Wednesday evening to celebrate the first day they were allowed to apply for relief from deportation and a two-year work permit under President Barack Obama's deferred action plan. But a half-hour before the 5 p.m. rally was to begin, a young member of the Arizona Dream Act Coalition started crying. "Guys, we have really bad news," she said, according to another activist, Erika Andiola, who was there. Arizona Gov. Jan Brewer had released a strongly worded executive order preventing deferred action recipients from obtaining driver's licenses or any other unspecified "public benefits" in her state, renewing her public spat with the White House over illegal immigration. The celebration stopped. Instead, Andiola and 100 other people turned their rally into a march to the Capitol to protest the move, and about 30 people stayed overnight. Brewer writes in the order that as many as 80,000 young people in Arizona could benefit from the new status, which gives young illegal immigrants under age 31 who came to the country as children relief from deportation and a two-year work permit. Brewer notes that the deferred action status does not make its recipients legal immigrants per se; it's more a limbo state where the immigrants are now not deportable and legally able to work but are not progressing toward a green card or other permanent legal status. Even so, the federal government says immigrants in this category should be allowed to have a driver's license under the REAL ID Act passed in 2005. But states can opt out of the REAL ID Act's requirements for a variety of reasons, and more than a dozen have done so. On a conference call with reporters earlier this week, an Obama administration official said it is up to states' leadership whether to allow deferred action recipients to apply for driver's licenses or for in-state tuition at public colleges. (A handful of states already grant in-state tuition to residents regardless of immigration status.) "DHS doesn't comment on state specific matters," agency spokesman Peter Boogaard said in a statement on Thursday. Brewer has decided no to both, writing in the order that providing any benefits to the young people would have "significant and lasting effects on the Arizona budget." But immigrant rights groups counter that it makes no sense to give young people the right to legally work but prevent them from legally driving to their jobs, and they are encouraging people to pressure states to allow them this privilege. "We're very concerned at what impact this could have across the country," said Oklahoma City, Okla., immigration lawyer Doug Stump. So far, it's unclear how many states might follow Brewer's lead, and no governor has yet announced that he or she will do so. Some states, including Alabama, already appear not to provide driver's licenses to deferred action recipients, instead requiring a green card from immigrants who want to drive. But until Wednesday, Arizona accepted the work permits deferred action recipients will receive as documentation to apply for a license.